The understanding of rates of reaction is a key step towards assessment of the feasibility of a reaction. The branch of chemistry which deals with this understanding is called chemical kinetics. The rate of a chemical reaction is defined in terms of the change in concentration of a designated chemical species which is a part of the given reaction. Of course, like any other rate that depends on time, it signifies the fastness or slowness – in this case, the rate of a reaction. The rate is taken as a positive quantity and a more steeper slope in the graph indicates a greater instantaneous rate. One important aspect that needs to be noticed while specifying the rate, is the stoichiometry of the reaction or in other words, the ratio of the chemical species involved in the process. Rate of a chemical reaction depends on the concentration of reactants/ products and time. Instantaneous rate is the best way to understand the rate of a reaction at a given point in time. In order to understand the rates of reactions, various theories have been postulated and one important theory is the “Collision Theory”. The basic assumption underlying this theory is that a chemical reaction occurs only when two molecules, each having a certain minimum kinetic energy collide along the line of approach. A reaction profile is good way to approach the collision theory. This graph depicts the change in potential energy of the colliding species, leading to the formation of products. The initial potential energy of the reactant is greater than that of the final products (since the products must be more stable), but the reaction proceeds through an intermediate which has an energy higher than the reactants. This extra energy is known as the activation energy and is reached when the intermediate is formed with minimum distance and maximum distortion among the reacting species. For the reaction to proceed towards the products, this activation energy barrier must be crossed. Rate of the reaction also depends on the collision frequency, i.e. the number of collisions and this is directly proportional to concentration of reactants. 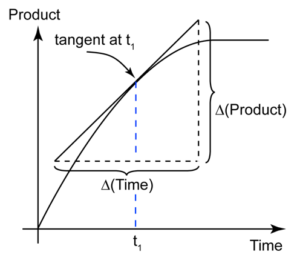 Collision Theory assumes the collision of reacting species along the line of approach to be the basis of a reaction. Activation energy is the minimum energy that must be possessed by the reacting species in order to overcome the energy barrier. Only those collisions which occur among the molecules having a minimum kinetic energy (Activation Energy) and along the line of approach, are considered as effective collisions. Rate of the reaction is directly proportional to the number of effective collisions. Increasing (or decreasing) the rates of certain reactions are necessary for various purposes. Herein lies the importance of a catalyst. A catalyst is a substance which alters the rate of a chemical reaction without itself being consumed into the final product. The reaction profile gives a clear view of the working of a catalyst. 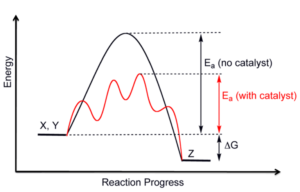 The action of the catalyst significantly lowers down the activation energy and most often breaks it up into small and separate portions which makes the intermediate more stable and hence increases the reaction rate. A catalyst alters the rate of a reaction. The action of catalyst involves the lowering of the activation energy and breaking the pathway into separately stable intermediates.